We, the owners and staff of Reserve Direct, believe in the joys and experience of travel—that's why we created the Reseve Direct Guarantee for our customers. The Reserve Direct Guarantee is our commitment to you, the traveler, that your bookings and reservations will be in good order when you arrive to your destination. In the unlikely event that they are not, Reserve Direct will work to make them right directly with the travel supplier or refund 100% of the travel product cost. All travel products booked on Reserve Direct will be consistent with the description of the travel products on our websites and your travel vouchers. Reserve Direct strives to bridge the gap between travelers and the travel products, but sometimes human errors happen. 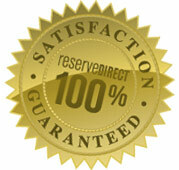 When they do, Reserve Direct will work with you and the travel supplier to make them right. With Reserve Direct's personal relationships with travel suppliers, we have secured deals with travel suppliers to provide reliable and sometimes discounted tickets and lodging to travelers. We realize there are many websites selling travel products, and in many cases, we are the least expensive out there. In other cases, comparable tickets may be a few dollars cheaper, but we're sure you will agree our service makes up the difference. Look—we know there are a lot of websites out there selling similar travel products with prices that may or may not be higher than ours, but we hope that our experience and commitment to service might make the difference in your decision. Reserve Direct, a travel-based reservation system and software company with direct, local connections to the managers and owners of all travel products available on our website. We've been providing online reservations in communities all over the country since 2001, and the reliability and quality of our website functionality rivals the national brands. (Check us out or call us up at 1-800-590-8125). ReserveOrlando.com offers great deals through its relationships with local travel suppliers and does not maintain low rates by soliciting you or "tricking" you into timeshare tours. Period. To date, Reserve Direct's websites remain the only Internet reservation sites available that operate through a personal working relationship with area hotels, theaters and attractions. Every product you see on any of our websites is directly managed and updated by those hotels, shows and attractions that you're visiting. This allows customers to see "live" availability of products. What does "live" really mean? It means that area hotels, shows and attractions load inventory directly into the Reserve Direct system. When customers enter specific travel dates, the actual availability is displayed. This assures our customers that they are getting reliable information directly from the hotels, shows and attractions themselves, saving customers time, money and hassle when planning their vacations. No More Unreliable Transactions with Fly-By-Night ticket re-sellers. Reserve Direct also works with many travel professionals across the nation who can provide you with the same personal service and assistance when planning your next vacation. We offer complete, guaranteed online reservation services, and courteous reservationists to assist travelers by telephone.